Learn more about this research by viewing related presentations and download the full manual on the Project Overview page. Hear firsthand from the researchers by tuning in for the webinar on December 4 (recording available post-webinar). Prepared by TREC, the Federal Transit Administration (FTA) has just released a Manual on Pedestrian and Bicycle Connections to Transit. TREC Director Jennifer Dill and TREC researcher Nathan McNeil worked with the FTA to develop the manual, a guidebook to creating a robust network for active transportation and transit users. From defining "access sheds" to linking up transit and bike share, the newly published manual is a rich resource for planners and engineers looking to boost their city's bicycle and pedestrian transit access. Learn more about this research by viewing the final report and related publications on the Project Overview page. The Federal Highway Administration issued an interim approval for bike signals, based on the NITC project "Operational Guidance for Bicycle-Specific Traffic Signals." 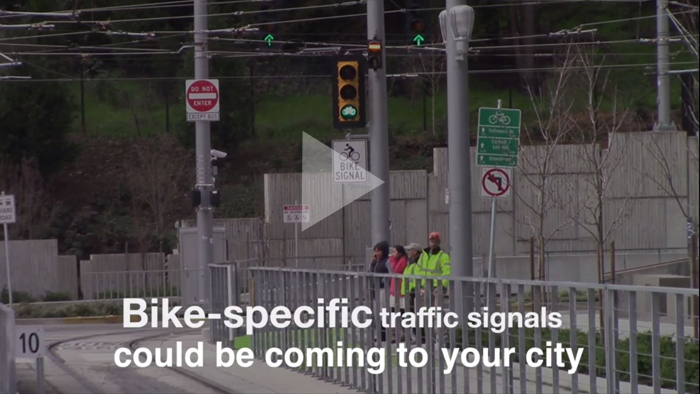 The project, selected in 2015 as one of AASHTO's "Sweet Sixteen" high-value research projects, has been widely cited and the research is instrumental in beginning to standardize the use and design of bicycle signals. A new NITC report introduces an important tool for safety analysis: a naturalistic method of data collection that can be used to improve the cycling experience. Before now, most naturalistic studies (studies where data are collected in a natural setting, rather than a controlled setting) in bicycle safety research have been captured by stationary cameras and haven't followed cyclists along a route. Researchers in this study used first-person video and sensor data to measure cyclists' reactions to specific situations. Safety research in general has advanced significantly through naturalistic driving studies, which gather data from real drivers to illuminate the causes of traffic incidents both major and minor. For motorized vehicles, the U.S. Department of Transportation has been developing portable, vehicle-based data collection technologies since the early 1990s. Portland State University researchers Feng Liu, Miguel Figliozzi and Wu-chi Feng sought to capture the cycling experience with physiological sensors and helmet-mounted cameras. Alex Bigazzi, a 2014 NITC dissertation fellow and graduate of Portland State University's Civil and Environmental Engineering Ph.D. program, has published a paper based on his NITC-funded research in Environmental Science & Technology, a journal of the American Chemical Society (ACS). See ACS coverage of the project here. Bigazzi's research evaluates the concentration of air pollution encountered by cyclists in Portland, Oregon. In the study, volunteer research subjects rode bicycles equipped with instruments to collect high-resolution bicycle, rider, traffic and environmental data. Participants rode a variety of routes including bicycle lanes on primary and secondary arterials, bicycle boulevards, off-street paths and mixed-use roadways. They were told to ride at a pace and exertion level typical for utilitarian travel, and breath biomarkers were used to record the amount of traffic-related pollution present in each cyclist’s exhalations. Protected bicycle lanes have gained popularity as a safer way to get more people cycling. Earlier research from the Transportation Research and Education Center, TREC, at Portland State University showed that people feel safer in lanes with a physical barrier between bicycle and motor vehicle traffic. The research hadn’t closely studied the intersections, where the barriers—and the protection they offer—go away. With little research guidance, agencies across the country could face the prospect of using untested approaches or avoiding protected lanes altogether. TREC, through its National Institute for Transportation and Communities pooled-fund program, is now addressing intersections for protected lanes. The program lets agencies and interested partners invest small amounts to join research with a national impact. For this project, 11 partners each put $5,000 to $50,000 toward the $250,000 cost. The project will help agencies decide which intersection treatments to use in which cases, and what elements each should include. Toole Design Group will work with the Portland State research team to tailor the results to practitioners.